I know this blog has gone from quasi-interesting to me complaining about moving. That will end soon, I promise! 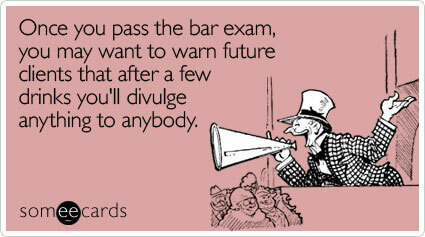 Like today I will complain about the bar exam! Ok, no complaints, just a note that between moving and taking the WA state bar exam this week, plus working, interviewing dog walkers, visitors from the Other Washington (!) and you know, life, I know this won’t be a prolific week of blogging. So I leave you with these bar taking gems. Ever since I took my first (and only to this point) bar exam, the last week of July has caused little panic attacks inside me. Just seeing the “good luck bar takers” messages on Facebook makes my heart beat faster. So the realization that I have to take the exam (only part of it thank goodness) this Thursday is freaking me out. Taking the bar exam is a bit like flying – you have to have the proper identification to be let into the room, you have to be there two hours before the test starts, you have to have all your approved personal items in a ziploc plastic bag, you may only go to the bathroom at approved times. The whole atmosphere is designed to freak us the heck out. In an effort to stay calm, see the hilarity in the situation and hopefully entertain my readers, here’s an ecard from someecards.com. As someone who is studying to take the Professional Responsibility portion of the exam, I can tell you this behavior would violate the Washington Rules of Professional Conduct. And for those who may be taking the exam this week as well, you know the comfort and pain brought on by BarBri outlines and lectures. This BarBri fortune cookie made me giggle in a way that only someone who has listened to a BarBri lecture would giggle. When I return from the Eastside (I know, I have to go all the way to the Eastside to take the exam!!) I promise we will return to our regularly scheduled programming of weight battles, Seattle food, dock dogs(!) and new homes. Sending you good bar-taking vibes. Who's more qualified to take the ethics portion of the bar than yourself? Good luck and happy thoughts to my beautiful and talented attorney wife, who is no doubt doing great on the bar exam as we speak…go get em, L!